The small town in the Hautes Alpes departmetn in France now known as Monêtier les Bains was known to the Romans as Stabatio and even then was renowned for the healing properties of its spa. Stabatio became Monasterium, then Monêtier de Briançon during the Middle Ages, then finally Monêtier les Bains in the 19th century. A pharmacist from Paris wrote of the area, "An abundant vegetation covers the entire valley, the animals are full of vigour, men acquire strength, size and shapes that contrast sharply with the sickly appearance of those who live several neighbouring countries." The naturally warm springs with their healing properties were ignored for decades in favour of winter sports but more recently they have been rediscovered. The baths pictured on the postcard were opened in 1999. They were considered something of a pilot study for the more recent opening of "Les Grands Bains". The waters are reputed to have properties that are helpful for gastric, rheumatic and skin problems, but I'd still prefer not to be surrounded by snow while taking the "cure". A post for Sepia Saturday. A click on the button will take you to the Sepia Saturday blog. Wow! How interesting that these waters are considered helpful for those health problems. That sounds like a claim from the distant past! The warm water looks inviting and I think having the snow around adds to the experience. I love this remark of the Paris pharmacist about the sickly appearance of those who live [in] several neighbouring countries. I wonder how many Italian and Swiss friends he had. In any case, I know from experience the Hautes Alpes is beautiful country! PS Couldn't resist following your blog as well! That looks like a very neat destination point. Besides, I want to be healthy, not sickly like the women in the neighboring villages, lol. Inviting - despite the snow. I wonder when it is deep enough to roll it. What a lovely, inviting place. 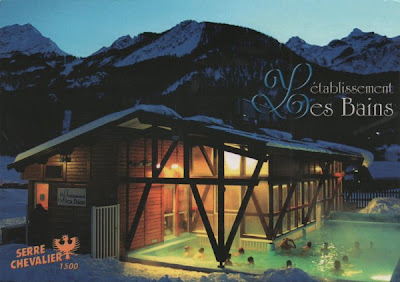 I never thought I would like to soak in hot water surrounded by snow - but that place makes it very appealing. I have never experienced natural warm springs but sure would like to. Check out Shatley Springs in Crumpler, NC about their healing springs. I have been there and drank their water along with the best food I ever ate. Interesting place for sure. Several of our fellow bloggers have posted pictures of spa resorts that are no more, so it's interesting to see one still alive and well. Now why am I thinking of James Bond? Or "The Pink Panther"? Warm water and snow seem like a pretty good combination, though I would like the warm to follow the cold (not like a sauna).